Well, we didn’t have much time to write since we last posted. We said we were on our way to the Pacific coast. 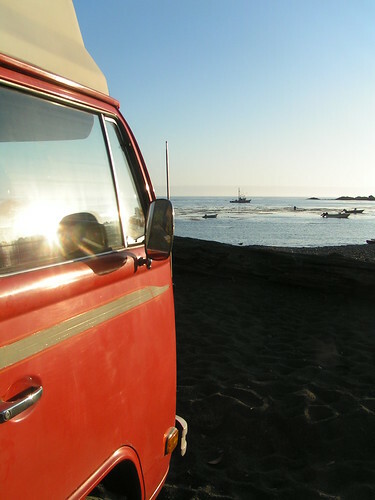 We drove across Oregon until we got to the Cascade Mts, and then we got to the coast. The Pacfic Northwest coast line is volcanic, and it was very rocky with rocks sticking out of the water close to the shoreline. It was foggy when we got to the coast, and remained foggy until we got to LA! Put there were some spots of sunshine, which was nice. We drove down the coast of Oregon, and upon entering California, we came to the Redwood National Park. You don’t really enter it, it is just an area along the coast of upper Cali which protects the Redwoods and Giant Sequoia trees. The Redwoods and Sequoias are sooooo huge! And they are very very old too. We learned that the biggest Redwoods and Sequoias are 2,000 to 3,000 years old!!! The trunks of the Sequoias are much thicker at the base, and tapers off as it goes up. The pines are also bushier. The Redwoods are slightly tinted red and the trunk of the trees is pretty much the same thickness all the way to the top, but thinner in general than the Sequoias. 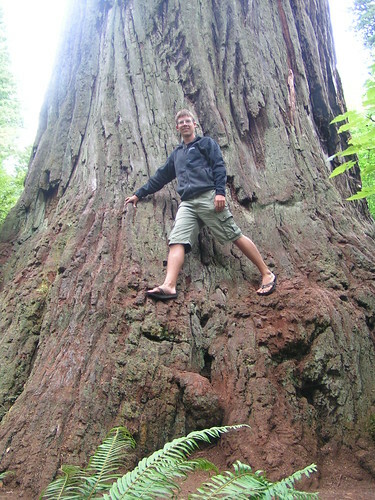 Redwoods are the tallest trees in any forest. They can be up to 370 ft and the Sequoias are about 300 ft. We visited one Redwood tree, called The Big Tree, which had a base circumference of 100ft! It was huge! 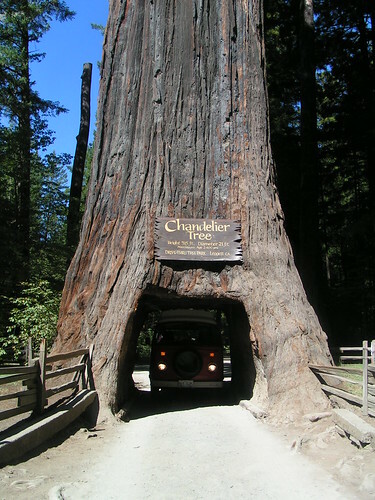 We also almost drove thru one Sequoia (one of only 3 that have a huge hole in it to drive your car thru). Well, we were a couple of inches too tall to fit under all the way, but we would’ve fit otherwise. Then we started making our way down the coastal Highway 1 to San Francisco. The coast was very similar to the Oregon coast, with all the rockiness. We wanted to go check out University of California Berkeley, Stanford University, and University of California Davis (which was more towards Sacramento). The coast was usually foggy b/c of the cold water, but when you went inland about a mile, the sky was all clear with no clouds, sunny, and hot! We first visited the schools. We liked Berkeley the best b/c of the neighborhood around it and b/c the campus was nice. Stanford was very rich-y rich, with a high class neighborhood and a fancy campus, complete with fake transplanted palm trees. Davis was out in the middle of dry flat valley land, and the housing was actually expensive in that small town. After checking out the schools, we went to downtown San Fran and had the San Fran experience. All those hills are a bit crazy for the manual VW. There is one big hill in the center of the downtown area which was so steep, we had to drive up it in first gear! We almost stalled because we were following a trolley car so close, and it would randomly slow down and speed back up again! All this up a hill that had to be 45 degrees! Next, we started driving towards LA. Along the coast, we saw Elephant Seals! The males started fighting right in front of us. We also saw dolphins swimming in the water along the coast. We got to LA and were greeted by so much traffic and the Baywatch lifeguard towers on the beach. The beaches were actually nice for being right in a huge city. They were the only place where there were no cars and relatively no smog. The smog was so bad in the rest of the city that you couldn’t tell there was a whole mountain range right next to the city! We visited Julie, who was working at the California State University at Long Beach along with Molly. We bummed a free shower at the dorms, and then we headed off to the beach to relax. While we were in LA, we visited California Institute of Technology in Pasadena, which we liked the best out of the LA schools. Also we visited University of California Irvine, and Southern California University, which was in the downtown LA area. The other two were in suburbs. LA wasn’t spectacular, but it had nice beaches and nice location. On our way out of LA, we stopped at a VW salvage yard to pick up some parts we needed for our sliding door. So far nothing wrong with the engine or anything. Since San Diego was so close, we decided to drive down there because there was only one school left for us to see, which was University of California San Diego. It was actually in La Jolla, just north of SD. We liked San Diego better than LA. While we were there, we visited UCSD and the beaches. We went to spend a day at Silver Strand State Beach, and the sand looked like it had real pieces of sparkling silver or gold in the sand. It was neat! The waves were fun. The next day we had to leave and start our way back north-east. We decided to head out towards Las Vegas, Nevada. 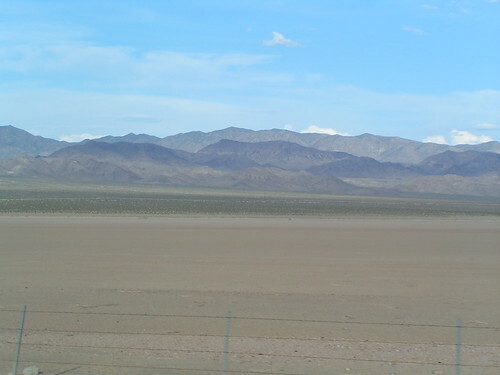 We had to first cross the Mojave Desert, which makes up most of California. It sucked! We got to Baker, Cali, which is in the middle of the desert, and the thermometer read 112 degrees! On top of no air-conditioning, we didn’t cool off much with the windows open- the air coming in to the car was over 100 degrees (maybe hotter), like standing in front of a heater. The desert had mini-mountains, which were very nice (maybe the only thing that made it OK). But we had to cross about three desert mountain ranges, which were very long, uphill sections where we could only go about 35mph, otherwise the poor VW would overheat. Nowhere have we seen so many cars pulled over on the side of the road with their hoods up, overheated. We even saw one Chinese tourist with his hood up, and he was trying to fan his engine with a piece of paper! Hahahaha! Well, the sun was going down, and we were approaching Las Vegas and Lake Mead, where there was camping. We wanted to go swimming in the lake (which was created by the Hoover Dam) but by the time we got there it was too dark out. We saw a Jack Rabbit. We thought it might cool off at night, like deserts are supposed to do, but no. It stayed about 95 degree overnight. We couldn’t sleep at all. IT WAS SO HOT and NO WIND!!! All of a sudden, after the sun came up again in the morning, the wind picked up like a wind storm. Finally, some relief but we couldn’t sleep in too long cuz we wanted to go see the Hoover Dam and Vegas before noon time. The Hoover Dam was really big and I liked the art deco styling of it. The lake it was holding back was low. The dam was something like 660 feet thick at the base and 45 feet at the top, where cars and people can go over it. After that, we went to go eat breakfast at a small diner in Boulder City. Next we went to Vegas, and drove down the strip. It was kind of gross. That’s all there is to say about it, other than the crazy lights and giant recreations of famous landmarks from around the world- New York, Paris, Venice, etc. Lots of people walking and getting entertained, drinking, and gambling. Boring! We continued out of Nevada, into Arizona for a short amount of time, and then into Utah. Utah is beautiful! We began to come out of the desert (finally, because I was gonna melt soon), and into the “staircase”, an area of canyon-land from Bryce to Zion to the Grand Canyon which is like stairs, highest at Bryce and lowest at the Grand Canyon. The lowest rock layer at Bryce is the top layer at Zion. The lowest layer at Zion is the top rock layer in the Grand Canyon. As we can into Zion, we thought we were entering a mountain range, but we were really going down into a huge canyon. We saw towering cliffs (about 2,000ft above our heads) of yellow, red, and brown sandstone. We took a shuttle into the canyon, and the guide told us how the canyon formed. The whole area was once a huge desert, like the Sahara Desert. Only this desert was covered in sand dunes 10 times as high as the dunes in the Sahara Desert today (which are about 300 feet high). So about 3,000 feet of sand dunes existed over our heads in the past. Then, as the climate shifted, a huge shallow ocean covered the desert, and the minerals from the water slowly seeped down into the sand below, cementing it into sandstone and also creating the colors. The reds came from iron oxide, or rust. Finally, when the ocean left, there was a hug flat meadow in its place. A river started flowing through it, called the Virgin River, and began to carve out a deep and narrow slit in the sandstone. Once it got down about 1-2,000 feet, it reached a soft clay and mud layer, which it ripped through with no problem, as compared to the harder upper layer. As the mud got eroded and eaten up by plants, the rock above it, overhanging, crashed down below, widening the canyon. Today the southern part of the canyon (the older part) is very wide. The area where the park is located is not as wide, but about as wide as it is high. The newest part of the canyon, which we hiking through, is about 100 times high as it is wide! 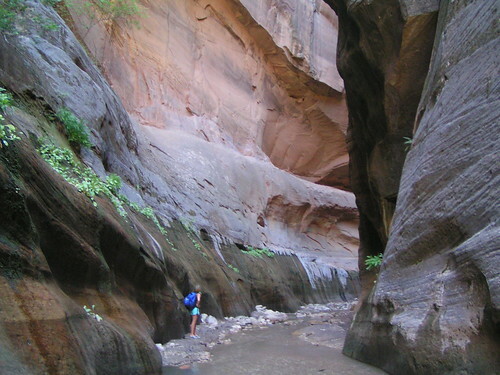 We walked through this section, called “The Narrows,” which is a wild trail where you wade through the Virgin River through the narrow and tall canyon. We had about 20 feet between the towering 1,000 to 2,000 foot cliffs of sandstone on either side. It was amazing! And the river keeps going for 15 miles beyond. It was nice and cool in the shade, cool water flowing, and amazing cliffs! Water also seeps from the rocks creating weeping walls. The water from the meadows above (when it rains) gets absorbed by the sandstone, and once it reached the bottom shale layer, it can’t penetrate it. It gets squeezed out of the cliffs. The water is carbon dated at hundreds of years old! That’s how long it takes for the water to seep from the top to the bottom! More of Utah. . .
Now we are out of Zion and we slept by Big Rock Candy Mountain, near Capitol Reef NP. We don’t have much time left, so we are headed to Arches NP by Moab, Utah next. By the weekend, we should be in the Denver area.